DAT Trendlines national average spot freight rates over the past four weeks. Graphic: DAT Solutions. The number of spot market loads on the DAT network of load boards gained 1.2% and truck posts were up 3.6% during the week ending May 12, which had a moderating effect on rates. The spring shipping season may be late, but it's finally here, especially in produce-distribution markets. This helped push the national average reefer rate up 1 cent over the past week to $2.49 per mile. 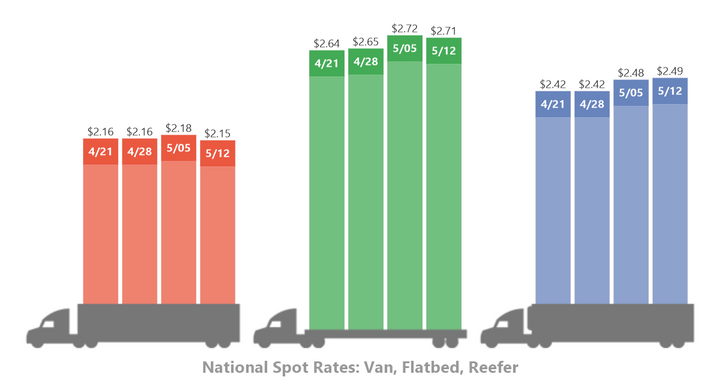 In contrast, the national average van rate fell 3 cents to $2.15 per mile, while flatbeds declined 7 cents from the previous week to an average of $2.71 per mile. The small improvement in rates, which include fuel surcharges, happened as the national average cost of fuel increased 2.2% over the previous week to $3.24 per gallon. Flatbeds: Nationally, the number of flatbed load posts declined 1% while truck posts increased 8%. That caused the load-to-truck ratio to cool, falling 8% to 102 loads per truck.